Ditch the buns in these inventive BBQ Jibarito Burgers. Skillet-cooked plantains and a garlicky sour cream sauce make these BBQ Jibarito Burgers a dish the whole family will love. Mix sour cream and garlic; cover. Refrigerate until ready to use. Meanwhile, mix meat, onions and barbecue sauce. Shape into six 1/2-inch-thick ovals, about 6-in long; set aside. Cook plantains in 1 Tbsp. of the dressing in large skillet on medium heat 3 to 5 min. Add 1 Tbsp. dressing to skillet. Turn plantains over; cover. Cook an additional 3 to 4 min. or until tender and lightly brown on both sides. Use slotted spoon to transfer plantains to a working surface; flatten, one by one, with a small cutting board to 1/4-inch thickness. Working in batches, heat 1 Tbsp. 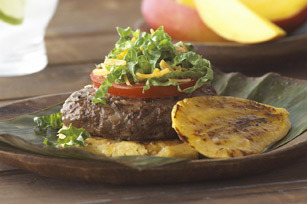 of dressing in skillet, return 3 to 4 flattened plantains to skillet; cook 1 min. on each side or until golden brown on both sides. Remove from skillet; keep warm. Repeat with remaining plantains, using more dressing if needed. Meanwhile, heat 1 Tbsp. of the dressing in large skillet on medium heat. Cook patties in batches 3 to 5 min. on each side or until cooked through (165°F). Remove burgers from skillet. Cover to keep warm. Place 1 of the plantain halves, cut-side up, on each of six serving plates; spread with sour cream mixture. Top each with 1 of the burgers, 1/4 cup shredded lettuce, 1 tomato slice, about 2 Tbsp. of the shredded cheese and second plantain half. Place plantains in very hot water for easier peeling; let them sit in the water for a few minutes. Cut off about 1 inch from both ends; make 2 lengthwise cuts at opposite ends of the plantain. Slide your hand under the skin and begin to pull it away, going from top to bottom. Soak the peeled plantains in salted water until ready to use. Drain on a paper towel before cooking with them. Place plantains, cut-sides down, on cutting board. Use second cutting board or flat dish to evenly flatten plantains, then add to hot skillet to brown as directed. Enjoy a serving of this special occasion burger at your next get together with friends! It is best to cook plantains in batches, keep warm as you continue cooking the next batch. Prepare as directed, using BREAKSTONE'S Reduced Fat or KNUDSEN Light Reduced Fat Sour Cream, extra lean ground beef, KRAFT Light Zesty Italian Dressing and KRAFT 2% Milk Shredded Reduced Fat Sharp Cheddar Cheese.